How can the sport of hockey be so important – instrumental even – in the future success of a young man or woman? After all, it’s just a game. But it can be so much more than that. It’s a beacon of hope for wayward kids. A fitness program to fight the epidemic of childhood obesity. A meeting ground for lifelong friends. But at its heart hockey is, and should be, fun. 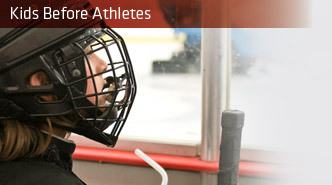 A chance for kids to pour out their passion and creativity on the ice. For them to learn and grow with every practice. To just be a kid and enjoy the game. That’s what the ADM is all about. So while we honor our past accomplishments, we need to look ahead and create a brighter future for all. With your guidance, the ADM will provide those great moments for our kids. That is, if we’re forward-thinking enough to see it through. Put yourself in the shoes of an 8-year-old and ask yourself some questions. What’s important to you? What kinds of things do you want to be doing? (And, maybe most important, what’s for dinner?) Now list the things that would be appealing to the 8-year-old you. Family. Playing with friends. Goofing off. Because this is what kids do. They act like kids. There isn’t a parent, teacher or coach who wouldn’t agree that today’s kids are brimming with potential. And there’s that word: potential. It’s the great “what could be” in a kid – if given the proper push. A push from an encouraging parent, great friend or dedicated coach. Wherever that potential forms, it takes time to develop and it’s different for each kid. The potential to be a doctor. A Hollywood star. An NHL center. The mission of the ADM is to pull out that vast potential in every kid. Hockey can teach kids a lot more than how to play the game. It can teach them to be better kids. The ADM not only will help associations, coaches and parents develop better hockey players; it will help them develop better kids. Not every kid that laces up skates will play in the NHL, but if we can teach them early on how to be better kids they could grow up to be better doctors, teachers, community leaders or whatever it is they decide to do.